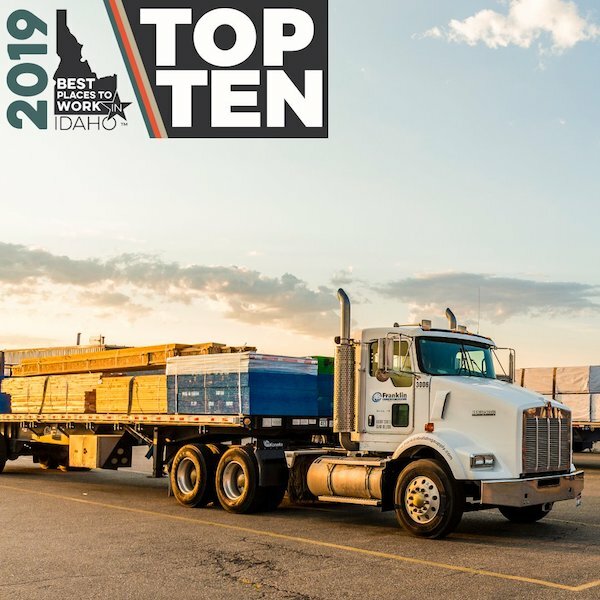 Franklin Building Supply, with locations in Idaho and Northern Nevada, has been identified as one of the Best Places to Work in Idaho in the category of Macro Employers, companies with a staff of more than 250. The employee-owned lumberyard chain is among the top 10 in its category and will learn its official ranking at an awards ceremony April 19. “Talk to anyone who works at Franklin and you hear a consistent theme: “this feels like family.” That’s because at Franklin, the Franklin people come first. They believe that the customer experience will never exceed the employee experience. In a business as complex and diverse as Franklin’s, this kind of employee centricity is the key to success. Lumberyards are a central feature in any town. Franklin fills that bill and much more. From lumber to siding and roofing and windows, to cabinets and insulation and flooring and doors, Franklin helps make building at every step of a project easier. Need help figuring out a project? Franklin people come to the rescue. The Best Places to Work in Idaho Program was created to identify, promote, and support Idaho’s best employers. Honorees are identified based on the results of a confidential employee survey. Franklin Building Supply has a deep history of helping make building easy for homebuilders and homeowners across the state of Idaho. Founded by Idahoans in 1976, Franklin touches more communities and provides more employment opportunities in Idaho than any other single building supplier.